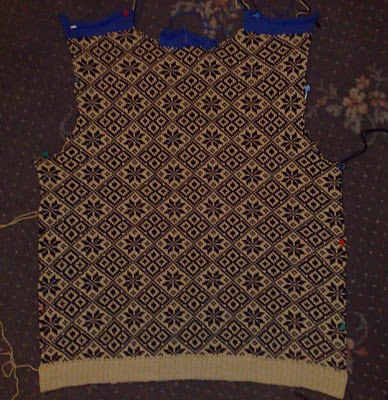 Yesterday I knitted a tension swatch for the sweater in that blue and beige yarn, I found the punchcard in a book some where and punched it out a while ago probably when I still had the knitmater 700, it was only yesterday I found it in my punchcard stash and decided to use it as I thought it would be a great Christmas sweater as the pattern it's self looks slightly Icelandic in my opinion. I was going to use knitware to knit this jumper but then went against that decision and used the knit radar instead. I have knitted the back so far, what do you think? I hope it doesn't appear too vintage looking or something an old man would ware but I like it anyway, lol. Was gonna say it looks quite 60s but in a cool sort of way? It looks funky and different and ... fab! It will look great. Its a lovely pattern! Thanks Phil, I thought it looked a bit 60s lol ahh well I still think it looks cool like you said too, haha. Just kind of a side not lol do you ever have trouble with your blog as in trying to get the writing and the picture on a post not like half way down the page, grrr. I like it, so what if it looks a bit 60s? As long as you like it that's all that matters. I think it's very Wintery - if you know what I mean. Thanks Susan, I guss you are right and I know what you mean it does look very wintery, it is definitely warm with all those floats on the wrong side. It looks great Alex. It's like the odd socks, in this day and age anything goes. The sixties look is back in vogue. I saw some girls with bu-font hairstyles the other day. I wanted to say, 'Hey, do you think you invented that look sweetie?' but I managed to just smile knowingly lol. Look forward to seeing it finished. You work so quickly. Beautiful! You will look quite dapper in it. Thanks maureen, I heard that too in alot of shops over here they are starting to bring back the 60's looks with a slight modern twist if you know what I meen. lol and I am hoping to start on the front tommorow but I am at college tomorrow so we'll see what happens lol. I thought you worked quicker than me I meen it took me a while to finish that v neck sweater, ahh well lol. Thankyou The sewing loft, I hope so lol, no I am only joking haha would be nice though if it does, hehe.